With Halloween just around the corner you may be wondering what you could hand out to those trick or treaters instead of the usual bag of Haribo sweets. 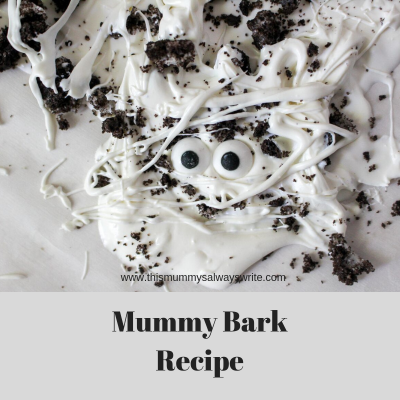 This Mummy Bark is quick and easy to make and looks great too – whether you are having a party at home or just handing sweets out to the neighbours children, plus they are simple enough for the kids to make on their own (with a little help with the melting). Spread ¾ of the melted candy melts over the parchment paper/greaseproof paper.